Let’s be frank: Marseille has a whopper of a reputation. When I was 17 and traveling around Europe for the first time, my guidebook painted such a scary picture of Marseille (crime! drugs! immigrants!) that I even wondered if it was safe to change trains there. As it turned out I didn’t have much choice, but I didn’t spend a minute longer in either the station or the city than I had to. And in subsequent years, though I found myself in the south of France many times, I never even thought to give Marseille a second chance. That is, until one of our best friends took a job there last fall and couldn’t stop raving about it. Turns out that was all the persuasion we needed to jump in the car and head south for a long-overdue acquaintance with the city. Most importantly, we found the people fantastic: gregarious, relaxed and far more curious about us than we’ve experienced elsewhere in France. And if I can give you a tip: whether you have to rent, borrow or steal one, bring a dog with you to Marseille. It will open more doors for you, literally and figuratively, than you’d think possible – the French are dog crazy. Our canine companion led to interactions in the unlikeliest of places. Heads would turn and conversations would stop as we walked past; every two steps someone would stop us to find out the particulars of her breed and temperament. She was welcomed in cafés, restaurants, bakeries and just about every shop we stepped into – usually by the entire staff dropping whatever they were doing to come fawn over her. The weirdest experience we had was when a police woman directing traffic left her post to come plant a kiss on our unsuspecting dog’s backside. I think she was aiming for the head, but Lily was understandably spooked by the strange mouth coming towards her and tried to dart away, causing the kiss to land on her derrière instead. I don’t know who was more stunned: us, the dog, or the dozen or so drivers that nearly plowed into each other at the unattended intersection. Bouillabaisse is not only Marseille’s most iconic dish, it’s one of those things tossed around in conversation as if everyone in the world were intimately familiar with it. How many times have you heard a fish soup from somewhere else described as ‘(insert-country-here)’s answer to bouillabaisse’? It’s the standard-bearer, the fish soup that defines all Mediterranean fish soups. Strangely for something so famous, however, it is one of the most intensely local dishes ever created and cannot, most people agree, even be replicated outside of Marseille (or at the very least, the Mediterranean coast of France). 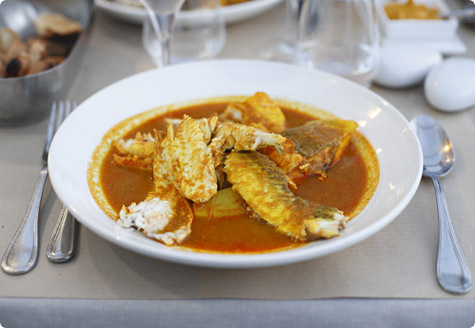 As it turns out, not many people in Marseille actually eat bouillabaisse anymore. In fact there’s some debate as to whether anyone but the city’s elite ever did. You’ve probably heard the popular bit of wisdom is that it evolved, like most Mediterranean fish stews, from the dregs of the catch. Julia Child – who lived in Marseille for a year – said, “you can make as dramatic a production as you want out of a bouillabaisse, but remember that it originated as a simple, Mediterranean fisherman’s soup, made from the day’s catch or its unsalable leftovers.” Some believe this may be nothing more than wishful thinking, though; there’s a convincing school of thought that says bouillabaisse, unlike its brethren around the Mediterranean, was a rich man’s dish from the beginning. Supporters of this argument point out that bouillabaisse is not made with just any fish but with quite specific varieties, none of which were ever abundant enough to be cheap, and that things like saffron and butter, both essential ingredients, would have been impossible for fisherman to afford until quite recently. But whatever its real origins, there’s no getting around the fact that today bouillabaisse is an expensive dish, and for a decent version you’re going to have to splash out a minimum of about €50 per person. There are cheaper versions to be found around the tourist-saturated Vieux Port, but, well, it doesn’t take a genius to figure out that you’ll most likely get what you pay for. Knowing which places to avoid, though, doesn’t make it much easier to choose where to go for this all-important meal. A quick google will net you impassioned endorsements of a half-dozen hallowed halls of bouillabaisse: Miramar, Le Rhul, L’Epuisette, Chez Michel, Chez Fonfon… After poking around on French-language forums I found another option: Chez Aldo, a fish restaurant on the quaint, out-of-the-way Port de la Madrague. It turned out to be an excellent choice. They have a beautiful seaside location, a smart but not stuffy dining room (dogs, I should mention, are more than welcome), a boisterous local clientele, and a very good bowl of bouillabaisse for the reasonable price of €45. You do have to pre-order your soup at least 24 hours in advance, and they’ll only make it for 2 or more people. It’s worth jumping through the hoops, though. A copious and multi-course meal of rich, briny soup, toasted croutes with garlic cloves for rubbing and spicy saffron rouille for slathering, and (just when you’re starting to regret not wearing something with an elastic waist) a pile of tender filleted rascasse, conger eel, monkfish and chapon large enough to feed a small army, bouillabaisse is as much about the setting and the ritual as the food itself. It may be expensive and ethically questionable to consume all those ever-scarcer fish, but there’s a reason people wax so lyrical about this soup, and I believe you have to try it at the source to understand why. 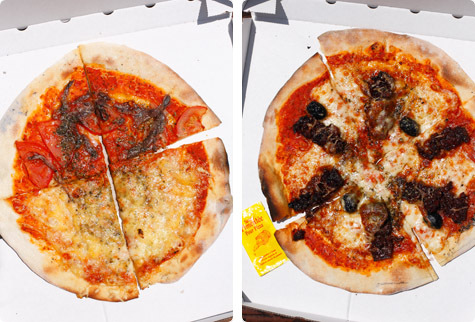 We all know about the bouillabaisse, but did you know that Marseille is also famous for pizza? 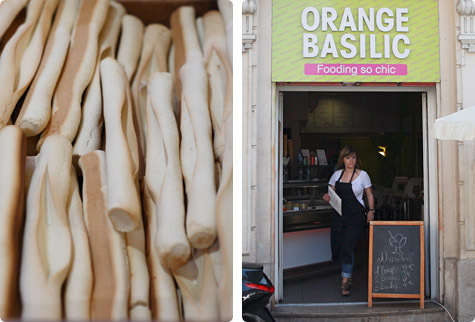 Apparently Marseille has long had ties with Naples, and over the years flocks of immigrants from the Italian city bearing recipes for their favorite snack have set up shop. 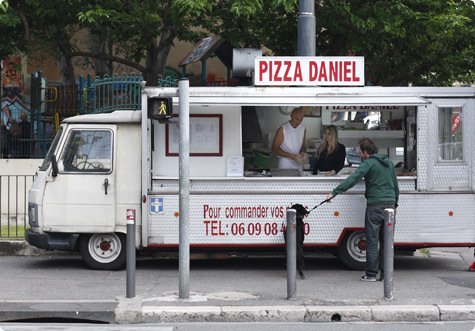 Everywhere you turn, there’s a restaurant, take-out place or street-side truck advertising pizza ‘au feu de bois’, baked in a wood-fired oven. And it’s excellent, without exception. We actually didn’t get to taste the most famous of all Marseille pizza, that of Chez Étienne, since it was inexplicably closed on the day we tried to go. Judging from Rosa’s report, that was definitely our loss. We also sadly couldn’t track down the pizza truck ‘Le Safari’ so glowing recommended by AJ and Michelle. We did, however, have pizzas from a little restaurant in our neighborhood and from a truck manned by a bald guy named Daniel, and both were incredible, with thin bubbly crusts, restrained toppings and nice charring around the edges. So it seems for good pizza in Marseille you just have to follow your nose. And wherever you eat it, don’t miss the two local pizza specialties: moitié-moitié, half anchovy and half cheese; and figatelli, a pungent smoked liver sausage from Corsica (both pictured above). And when they ask ‘piment?’ as they hand you your pizza, say oui: it’s a little sachet of hot chile oil you can drizzle on top to kick things up a notch. Yum. Anise-flavored tipples are popular all around the Mediterranean: Greece has ouzo, Italy has sambuca, Turkey has raki, Lebanon has arak. 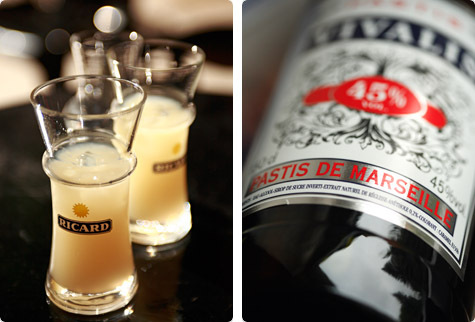 Marseille does them all one-up with pastis, the sweetly complex, herbal liqueur that borders on national obsession. Pastis was first commercialized in Marseille in 1932 by Paul Ricard, no doubt as a replacement for the similarly-flavored Absinthe which had been banned several years earlier. Today there are dozens of brands, each with a closely-guarded recipe that features such things as licorice, star anise, peppercorns, cinnamon, cardamom, nutmeg and sage. For the largest selection in Marseille check out La Maison du Pastis on the Vieux Port; here you’ll find close to a hundred different varieties along with a lesson in how to drink it (in an nutshell: pour it over ice, dilute with water to taste). Or visit any supermarket: the prices will be better and the selection only slightly less. 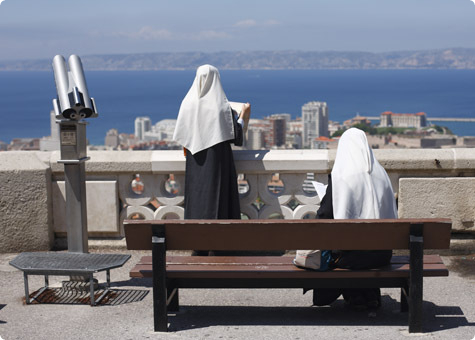 Marseille has always been a cultural melting pot, but these days the largest minority group to call the city home hails from France’s former colonies in North Africa. 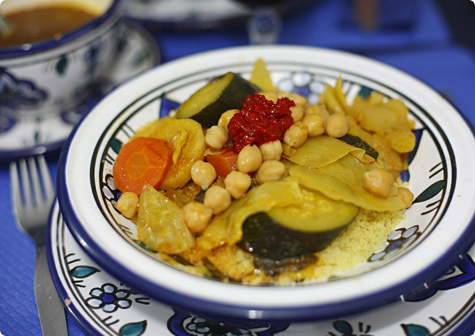 The integration of French and Maghreb cultures may have been (and still be) a bumpy ride, but a happy outcome of it is the copious amounts of delicious Moroccan, Algerian and Tunisian food to be found nearly everywhere in Marseille. In fact, I had better couscous here than I had on our trip to Morocco three years ago. La Kahena, a short walk from the Vieux Port, is a blue-tiled Tunisian restaurant with a concise menu centered around brik (fried egg, meat or fish-filled pastries), salads, and a dozen or so varieties of couscous. The light, fluffy couscous comes out in large bowls topped with vegetables, chickpeas and your choice of meat; on the side you’re given a bowl of rich, spiced broth to ladle over the top and a dish of pungent, garlicky harissa for that all important afterburn. Sadly it was so good I didn’t save room for the overflowing platter of syrup-drenched sweets the waiter brought by at the end of the meal, but they looked every bit as incredible. 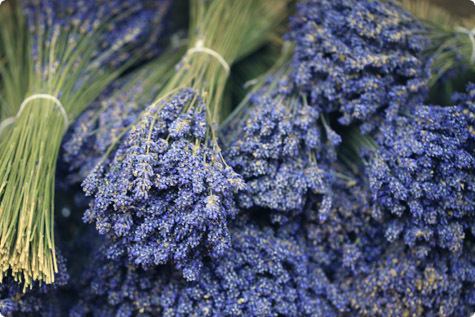 The Marché des Capucins is not your genteel lavender- and olive-oil-doused Provençal market. It’s a market by and for the sizable Arab community, and one of the most authentic North African markets you’ll find outside of, well, North Africa. The crowded, narrow lanes recall a medieval souk, as do the pushy vendors selling everything from exotic fruits and vegetables, gory slabs of meat and North African pastries to dirt-cheap couscousières, cell phones, clock radios and clothing. Things here are cheaper than elsewhere in the city, but to get the best bargains, be prepared to bargain. 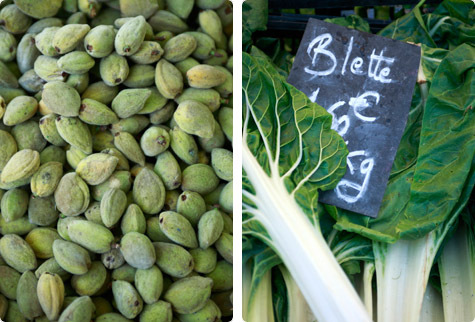 You’ll find this market centered around the Rue Longue des Capucins in the 1st, near the Noailles metro stop. 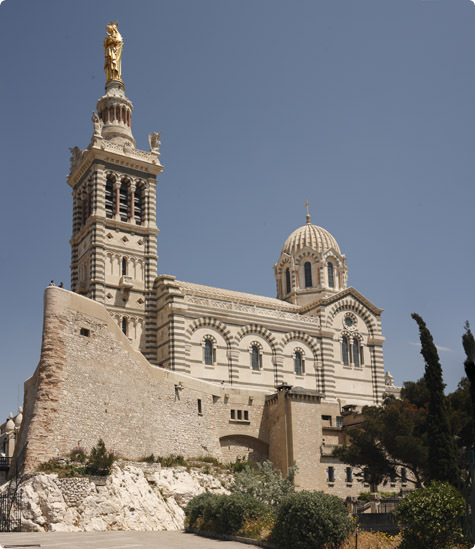 Not many cities in the world can offer as many dazzling locations within as short a drive (or train ride) as Marseille. 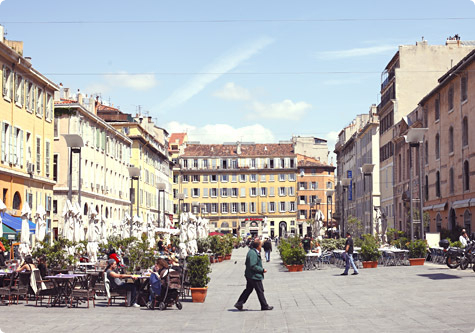 Forty-five minutes east takes you to the Côte d’Azur and all its glitz, glam and over-tanned inhabitants. A half-hour north lies Provence, and the picture-perfect cobblestoned towns of Aix, Avignon, Arles and Orange. 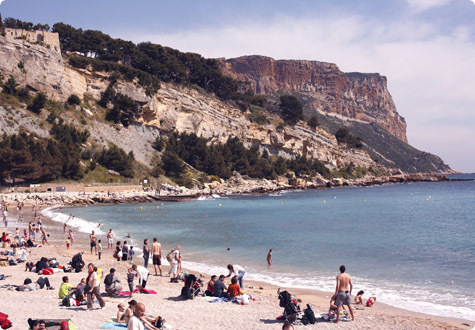 For an even quicker escape, head 30km to the south to the well-heeled village of Cassis where you can shop, dine, swim, or hike out to the Calanques, the spectacular white-cliffed coves that shelter some of the most beautiful beaches on the Mediterranean. Thank you thank thank you! Marseille has been on my radar since my first trip to France 5 years ago and I’m still drawn, just haven’t made it there. Every guide book I read says its a must yet whenever I mention it to anyone outside of France they raise their eyebrows in worry and say "stay away from marseille". This cements my desire to go there. I’m from Detroit, and your description makes Marseilles seem like a kindred spirit of a city- a bit rough around the edges but all the more interesting for it. 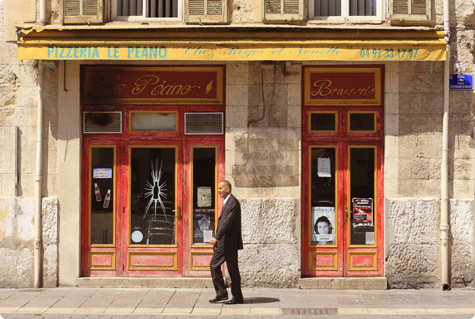 Such beautiful photographs and a convincing bid for Marseilles as a destination. I’m ashamed to say I lived in southwest France for a year and never went there- not sure why; I don’t recall being particularly intimidated. Very evocative post…but no place beats the Miramar for bouillabaise! Beautiful post and photos. This really makes me miss the south of France. I’ve been to Marseille a couple of times, but haven’t spent enough time there to really get to know it. I guess now I have many reasons why I should go back! I stopped in Marseilles once on a Mediterranean cruise and spent a day in Avignon, which was beautiful. Now I wish I’d had a chance to sample some of the food! That part with the police-woman and your dog made me laugh so much..As usual, your writing is so exceptional that I can picture the place even without your beautiful photos. I can’t wait for the day when I get to travel to France (sigh). Until then I read happily.. Fantastic post – I feel like (and wish) I was there. Definitely one of the many upsides to moving back to Europe! It sounds like you have an amazing time in Marseille. I only drove through there some years ago while on the way from Paris to Cannes with my family, so I hardly got the picture that you just painted. Sounds like you had delicious food and a marvelous time. This is what a great travel post is, it instantly makes you want to travel there. Beautiful photos as always! I love the mediterranean light in the pictures. It makes me homesick, and Germany is soo gray today. I am happy to hear I am not the only one loving pastis, most of the people I know get scared by the mention of the world ‘anis’! I’m kicking myself while reading this… while in France last year i had time to make a weekend stop in the South, before heading off to Barcelona. I was tossing up bw Avignon and Marseille but ahose Avignon, which was lextremely pretty, but well… completely boring! Really should have gone that bit further south to Marseille! You had me at Bouillabaisse (I mean, how gorgeous is that?!).Cheers. What a great read for me, and the photographs too! I have long wanted to go to Marseille, though blindly, thinking it would be just like Cannes, but you’ve cleared that up for me and now I want to go for entirely different reasons! Such beautiful pictures of Marseille. I did picture it a little bit dangerous and not as pleasant as other cities in the South of France. Thanks for the reassurance. The bouillabaisse and the couscous look fabulous. You’ve outdone yourself with this travelogue (no small feat, that!) Just beautiful. Beautiful pictures! I am totally convinced. You know, last year we drove from Stockholm to Tuscany. 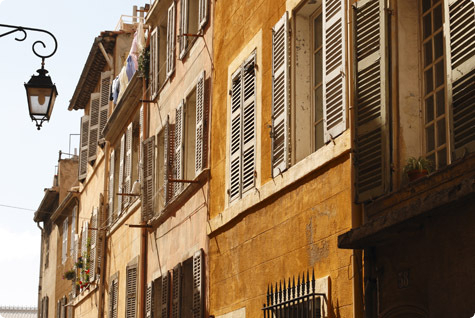 I wanted to revisit the Cote d’Azur, as it’s my favorite place in Europe…so hubby booked some hotels with our frequent flyer points, and one was in Marseille. I really really really did not want to go there, but it ended up being one of our best memories. Our hotel had a rooftop pool with a great view, love for our 4 year old! We found an awesome bouillabaisse at Le Calypso on the beach. Had some really excellent floral ice creams at that square you pictured above. It was hot, gritty and wonderful! Looks like a great city! Something I will have to check out next time I head over there which I’ll surely post pictures on my blog that I’ve been writing lately. It’s funny how guides have their own opinions on cities. But you did the right thing by checking it out for yourself! Having been lost in some of the seedier parts of Marseille, I am relieved to see that there is some real beauty there,- must try again!! 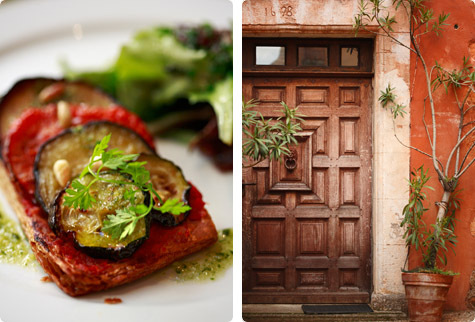 Superb pictures, especially love the one of the door! Great to read positive things about marseille but dont tell too many people as we love the fact it doesnt have too many tourists. Ive lived here for 2 years (m a new zealander) and have never seen or encountered any violence or even rudeness…the only negative is that the streets are dirty….but you cant have it all. You forgot to mention Le panier district (the oldest and most interesting area in Marseille I think) and Palais Longchamps….a beautiful park and garden area close to the station….both well worth a visit I think. oh, how i miss marseille!! thank you for beautifully transporting me back. xo. 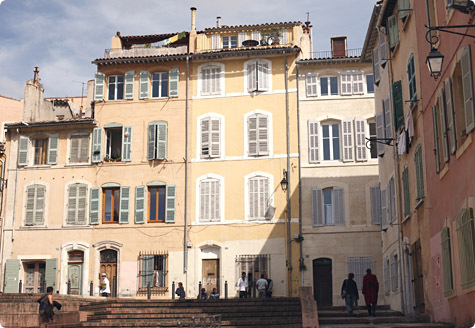 Thanks so much for this post – I'd been living under the same impression about Marseille for years (have only braved changing trains there!) I'd love to bring my dog – it would be a nice change to be able to go out with him (not an option where I live in the US). You sold me with the Bouillabaisse and Pizza…I'll make it point to stop and enjoy Marseille next time instead of just passing through. This is such an amazing post and the perfect thing to stumble upon as I leave for Marseilles tomorrow and I was wondering what to do there. I didn't even consider the day trip options out of the place, but now I'm so excited! I love love love your photos and I can't wait to try some ice-cream at Maison de la Glace! What a great article about my adopted city. You really capture what makes Marseille special. I read so much negative press about Marseille that sometimes I dread asking tourists what they think. When I do, they nearly always tell me they absolutely love it here! Great tips! I was in Marseille two months ago and I simply loved it! I would like to congratulate you on this great piece of poetic analysis of any city that I have ever came across, your passion for this beautiful city shines in an upward spiral the more I read your article, the photos were amazing.I once again thank you. I just returned from a work trip to central Florida and continue to feel like I was on an off-putting, strip plaza-filled, visit to the moon. 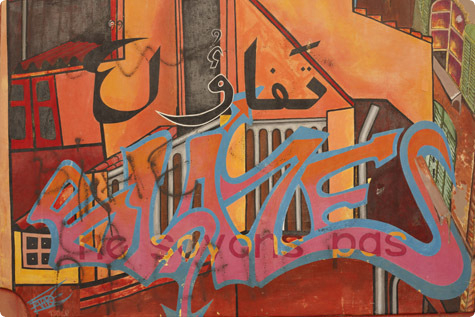 I came across your blog today and it brought back memories of one of the most interesting, gritty yet gorgeous, culturally-rich places I have been. And the food! Where else could one hear The Lounge Lizards from NYC in an old arena, savor great couscous, walk among palm trees by an old port, easily visit nearby ancient villages bathed in golden light, have one's first fajita, and feel welcomed and at home in another land? Fantastic post! I loved your writing style, great storytelling and very informative. We (partner and I) are in Barcelona and heading to Marseille on Wednesday, now we have a better idea of what we want to get up to. Thanks! I want to thank this post for inspiring me to go to Marseille. I had such a lovely time, and your blog was a ray of light into the dark comments online about Marseille. Despite the crime and gang violence, very little of it effects tourism, barely any of all. The sunshine was marvelous, the town gorgeous, the food fantastic. I'm sure I'll be back again. Anybody reading this — DO GO TO MARSEILLE! It's my favorite city in France.